The project was to re landscape from the front entrance way around the south end of the home replacing a gravel muddy path to an old weathered deck with a vegetable garden which was not being used. 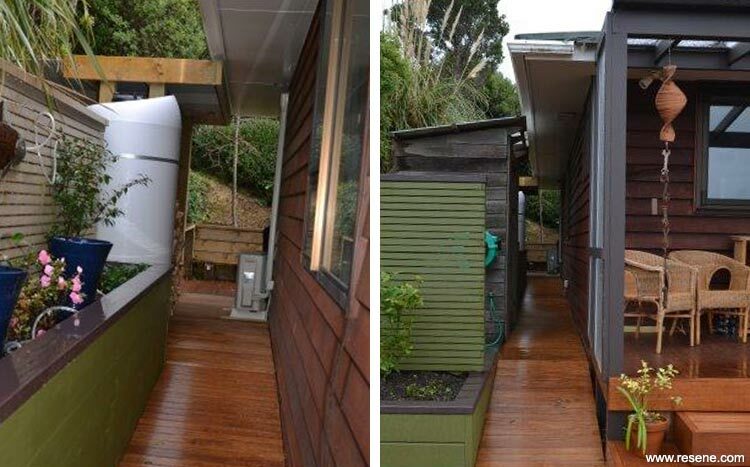 The overall concept was to modernise creating easy access around the home creating usable spaces for fire wood storage and the wheelie bins and recycling bins. To create the access a board walk was built from the front entranceway around to the existing deck. This consisted of flat board walks and ramps as there is a difference in levels from the entranceway to the back deck of about 600mm. This created easy access for the wheelie bins and to move firewood. To modernise the existing deck, the decking was replaced and extended with concave and convex curves to create interest and flair. The deck off the conservatory was extended with a veranda built over this area. As the existing conservatory was anodised bronze aluminium finish the timber work was painted with Resene Lumbersider CoolColour Coffee Bean to match the anodised bronze. Also as the floor of the conservatory was Kwila then Kwila decking was used for the veranda floor and stained. The main deck area was re-decked with premium grade pine and stained in Resene Woodsman Decking Stain Dark Oak. At the south end of the deck was the old vegetable garden. This area was lowered and a patio was made from exposed aggregate concrete mix with shell added and then honed giving an attractive finish. This area was cut into ‘large pavers’ and then grouted with a charcoal mortar. At the south end of the patio area raised planters were built with a pergola which in time will have a climbing rose over it. 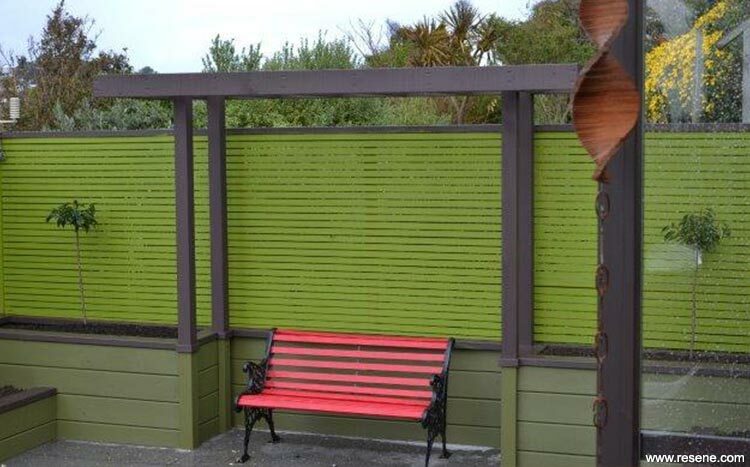 This has created a feature with a slatted screen behind painted in Resene Lumbersider tinted to Resene Pacifica to add more interest to the area complementing the Resene Waiouru on the balance of the slatted screens and the raised planters. 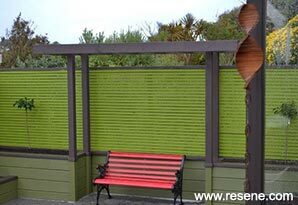 To join the colour scheme together, the pergola, slatted screen and the planter cappings were painted Resene Coffee Bean to follow the anodised bronze of the conservatory. 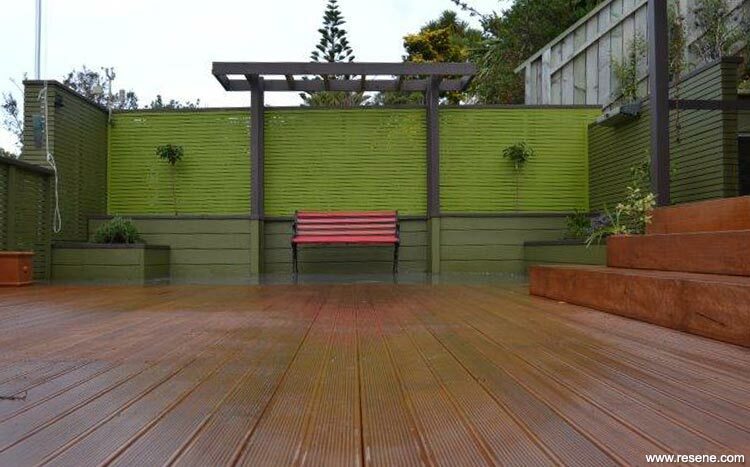 To give a further lift to the area under the pergola an old cast iron seat had the timber slats painted Resene Pohutukawa to match the front door.